As officer-involved shootings cities around the country, frustrated citizens are continuing their fight for justice. With each shooting that has occurred, dash cam footage has been released, surveillance and other forms of film have been released to ensure complete disclosure. But, unfortunately, that hasn’t been the case with the deadly shooting of Alton Sterling. After nearly three months, only the cell phone videos filmed by spectators have been released. In addition to the withholding of dash cam footage and surveillance, Baton Rouge police officers Blane Salamoni and Howie Lake II are still on administrative leave. No charges have been brought against the officers and citizens are wondering why. The recent officer-involved shootings that led to the deaths of Philando Castile and Terence Crutcher have resulted in charges brought against the officers. But, law enforcement officials in Baton Rouge have remained silent. Now, citizens and protesters are demanding answers. Why has the footage been withheld? Why haven’t the officers been charged? 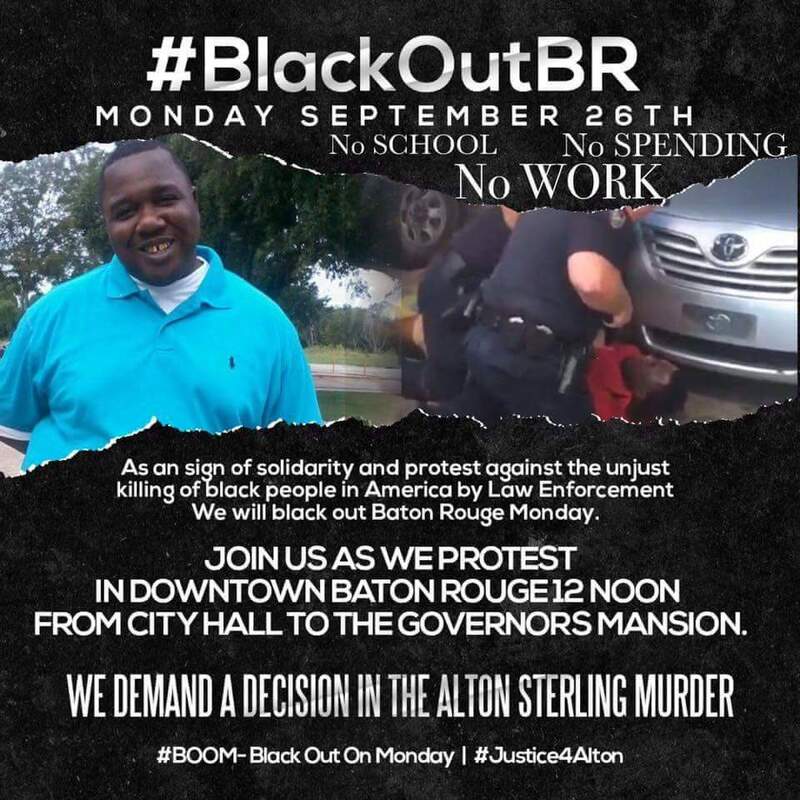 Monday, Sept. 26 was declared #BlackOutBR, a day where local citizens chose to wear black clothes and not work, go to college, or shop. A rally was held at the steps of City Hall calling for information on the Sterling case. After the rally, protesters entered a police reform meeting to hear the committee’s plans and demand answers and action. The committee included District Attorney Hillar Moore; councilmembers Tara Wicker, Donna Collins Lewis and Erika Green; BRPD Chief Carl Dabadie Jr; local pastors; and residents. “What happens when leaders & protesters disrupt a meeting on police reform? Things get uncomfortable, they get real, and then they get a seat at the table, alongside the chief of police, the DA, the DOJ,” wrote artist Walter Geno McLaughlin on Facebook. More than 30 protesters lined the walls of the small meeting room, including Alton Sterling’s aunts. Several protesters asked the committee for better communication and circulated a paper to add email addresses for future contact. They also presented a list of demands. The first demand is for a decision in the July 5th shooting. They are also requesting that changes be made to city and state flood contracts. The change to contracts would require the cancellation of current contracts in order to include Black-owned firms in renegotiations. Community leaders argue that the exclusion of government resources is a strong contributing factor to the financial inequity in the Black community. The officer-involved shootings in impoverished areas of the city are also arguably attributed to the lack of economic development.”You cannot prevent an Alton Sterling encounter without economic development in Black communities,” the list states. The third demand is in reference to police reform. With incidents of alleged injustices resolved with internal investigations, community leaders and local citizens adamantly believe there needs to be a task force in place on state and local law enforcement levels to reform police across the city and state. The demands have garnered criticism from local news outlets and citizens with opposing views. Those people against the demands said they believe they are far-fetched and argue federal authorities have refrained from filing charges because they haven’t been able to gather enough evidence against the officers involved. But, despite the arguments, the footage is still being withheld, which leads protesters to believe local authorities have something to hide. “These demands, especially the first two, are silly. The prosecutor should make a decision only when all the evidence is in. The flood recovery companies should only hire the best companies and people for the job,” wrote writers with The Hayride. The question remains: will officers Salamoni and Lake be charged in connection with the shooting death of Sterling? At this point, no one knows what the outcome will be. The case is currently still under review by federal authorities. It is still unclear whether charges will be filed against Salamoni and Lake. This article first appeared in The Drum on Sept. 28, 2016.